Making an effort to change your eating behavior over time will eventually allow you to take full control of your health. Your diet is actually one of most critical factors in keeping you healthy and free of chronic conditions such as high blood sugar and diabetes (and even cancer). Helping people return to health is I have written 3 books on these topics…. 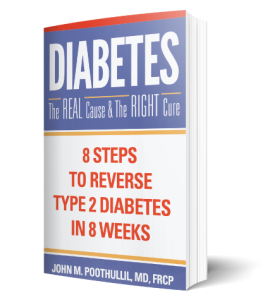 And today I learned with much excitement that my eBook, Diabetes: The Real Cause & The Right Cure has hit the #1, #2 and #4 spot in various Kindle categories. I truly hope that my information is helping as many people as possible. Thank you for reading the blogs, buying books, and sharing the message with your friends and family. If you have read the book, kindly leave a review on Amazon! This week I am sharing Part 2 of my video series on how you can eat a lunch or dinner completely without grains or grain-based foods. (See Part 1) You don’t need bread, rolls, rice, corn, or grain-flour products with your meals. Following the video, you will find an excerpt from Diabetes that discusses how the brain and hunger work and offers recommendations for creating new pathways around food. Here is another filling example of a delicious filling lunch made without any grain products. This hearty feast includes sprouted mung beans with shredded coconut, a mushroom omelet, vegetable salad, tomato chutney, plantains and assorted fruit. This type of meal offers all the nutrients you need without bread or other grain-based products. Throughout your life, each time you have eaten something, your brain has received millions of signals from your taste and smell receptors. 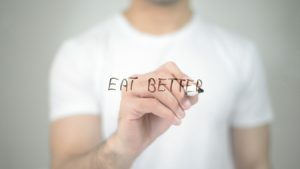 Each experience has produced specific connections between nerve cells in your brain to form pathways about eating, which have been strengthened through repeated use. The way you have been eating has effectively been “hardwired” and solidified as a neural network in your brain. It has become self-sustaining and, more importantly, hard to change because it’s not stored as a file that can easily be deleted. It used to be thought that once the brain had established most of its connections during childhood, it only changed in response to aging. However, it has come to light that the brain has the ability to rewire itself to form new connections and learn different solutions to obtain a different result. This resourcefulness of the brain can be used to over-come an established behavior and accomplish a positive outcome. Whenever you learn something, new nerve connections are established and consolidated. Unlearning something (such as an old habit) therefore requires weakening of the established connections between neurons. Because this work has to be done piecemeal, it takes time. Luckily, the adult brain is reasonably accustomed to unlearning. If you ever moved homes or changed cities to study or work in a new city, you probably had to change your routines and habits. If you started living with someone, you had to rearrange millions of brain pathways to accommodate that person. Such unlearning requires “deconnecting” established neural paths and making new ones, one pathway after another and one network of neurons after another. The point is, somewhere in your past, you have unlearned some things and learned new ones. You can do it again. The same unlearning and new learning can occur to retrain yourself about how and what you eat. Walk around your home and identify the areas and sights that test and break your control over food—and eliminate or modify them. For example, put all food in cabinets where it can’t be seen. Don’t shop for groceries on an empty stomach. Buy food only using a prepared shopping list so you are not tempted to buy extra items on impulse. Pre-plan your meals and cook up and serve smaller portion sizes. Avoid locations that you associate with eating, such as food aisles in convenience stores, fast-food restaurants, stores serving free food samples, and vending machines that prompt you to buy food on impulse. Work on creating an environment that is not focused around food in your home. If pleasing sensations that are commonly paired with eating surround you, it’s hard to deny the impulse to indulge. The sight and smell of sweets like ice cream, cookies, and cakes can stimulate the urge to eat, so don’t bake desserts and don’t stock ice cream in your freezer. The goal is to decrease temptation by reducing the sights, sounds, and smells of pleasing impulses.